Excess portions of ink is scraped with doctor blade, which is running in the doctor chamber, applied to the anilox roll, and constant volume of ink according to a cell volume of the anilox roll is transferred on anastatic face on the printing plates. And then the ink is transferred from the top of printing plates to material to be printed. Honeycomb cells are engraved on the anilox roll surface. Ceramic is coated on the metal roll surface, and engraved by razor. In recent years, higher frequencies along with securing cell volume and adequate volume of ink is advanced. 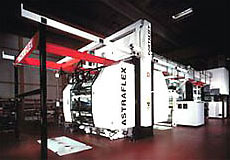 Recent quality progress of Flexo printing has been realized thanks to advanced technologies of the anilox roll. Printing plate made by negative film is fixed to plate cylinder using double-faced tape. Plate is made by CTP（Computer to Plate） without using film. Repeatability of halftone dots has been successfully improved.. Plate is made directly on the sleeve by CTS（Computer to Sleeve）. Therefore, endless plate can be made, and estimated accuracy has been substantially improved.